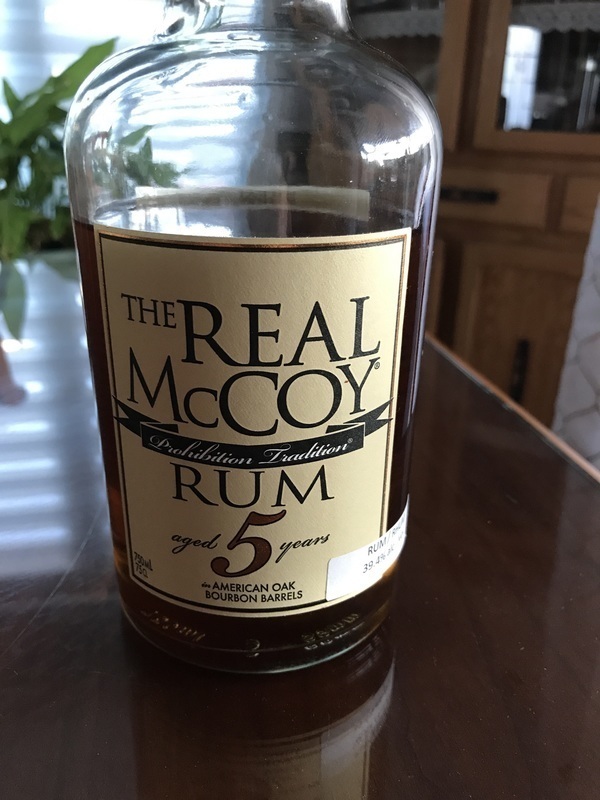 Have you found an online vendor selling The Real McCoy 5-Year? The Real McCoy is a blend of rum produced from the distillation of blackstrap molasses, using a combination of both column and pot stills. The rum is aged for 5 years in Kentucky bourbon barrels, then blended with Bajan spring water. 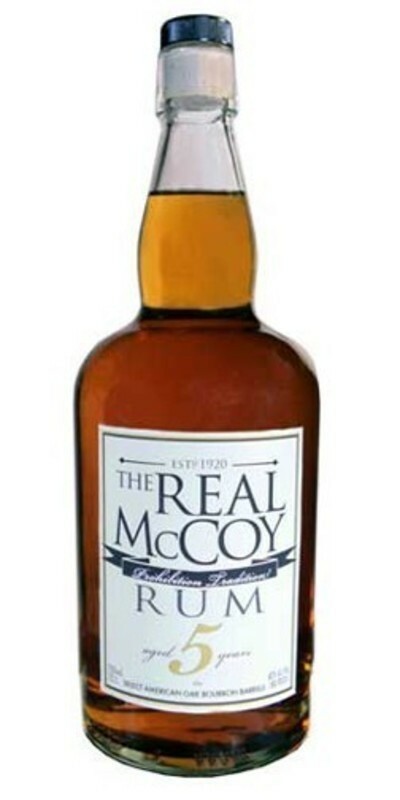 The Real McCoy rum's heritage is based on the story of Bill McCoy, the pioneer rum runner of the prohibition era. McCoy fueled the Roaring Twenties by delivering over 2 million bottles by sea to New York speakeasies. He became well known for always delivering undiluted alcohol, unlike other rum runners who cut the liquor with prune juice, wood alcohol, or even turpentine, That is why he and his product became known as "The Real McCoy." .....this is an expensive rum, and to me, not better. I prefer the soft oaky balance of the Doorly's to this one, which has a harsher spirit edge and a dryness that is a little too much for me. There's also a hint of biterness on the finish, that isn't there with the Doorly's. Don't get me wrong, it really isn't a bad rum at all, and it probably does have a touch more sophistication to the Doorly's, but it's just that the Doorly's is so easy to drink. Also, I never like marketing exercises which this effectively is. The Real McCoy 5yo retails for £30 while the Doorly's 5yo retails for £23. Why would you buy the more expensive Real McCoy when you can get the real McCoy (as labelled and sold by Richard Seale) for less? EDIT - it is still expensive...same sort of price as the Doorly's 8yo or if a decent place, the 12yo. Now that the bottle has been opened for a while, it is displaying a softer edge from the oak. It is softer than the Doorly's 5yo, and re-evaluating, it is a better rum but I cannot reconcile the price. Bourbon/brown sugar flavor but not nearly as much as the 12 yr and with a younger harsher bitterness and burn that isn't there with the 12. I won't be getting this one again. On the dry side with some burn. The flavors marry well together. Oak, spice and brown sugar with a hint of vanilla and caramel. This is a nice sipper for the price. This also gets into the price where you probably shouldn't be mixing this good rum. Looking forward to the 12 year. Surprisingly smooth for a 5-year. Naturally sweet (no additives). Beautifully distilled, blended, and aged rum from Foursquare. The price is high in its category, but fair. Tasting the exceptional (and much more expensive) 12-year McCoy side-by-side with this one, there was very little difference. Grab this bottle if you find it. When this one is sipped it has a strong whiskey-like initial bite. it has flavor but is a bit harsh. It does open up a bit after a "few". Let me talk about this rum, It is interesting but is very very not interesting, is a usual rum and nothing. What a great rum! having been retell introduced to rums that are not full of sugar and vanilla, I must say this is by far one of the best that I have tasted. Smooth with oaky overtones that sips like the finest bourbons that I have tried. Definitely will be enjoyed by whisky drinkers and rum drinkers alike. The bourbon aging really imparts some serious whiskey undertones and a dry boozy bite that I don’t usually seek in my rum. The complex spiced flavor is overshadowed by the bourbon bite when used as a sipper. As a mixer in simply cocktails where the rum is well highlighted, it does pretty well. The bite is balanced out nicely and the complexity of the flavors presses through. As a mixer, this is pretty good. But, as this price point, I expect some smoothness and sipability. This rum has a youthful rawness that makes it less desirable. This rum isn’t bad per se, but there are some better rums for the price. .. however back to the rum .. decent no's e on it of a dry rum that has hints of smokiness but not too overpowering ..
Had a rum tasting on a sunny afternoon, because why not. 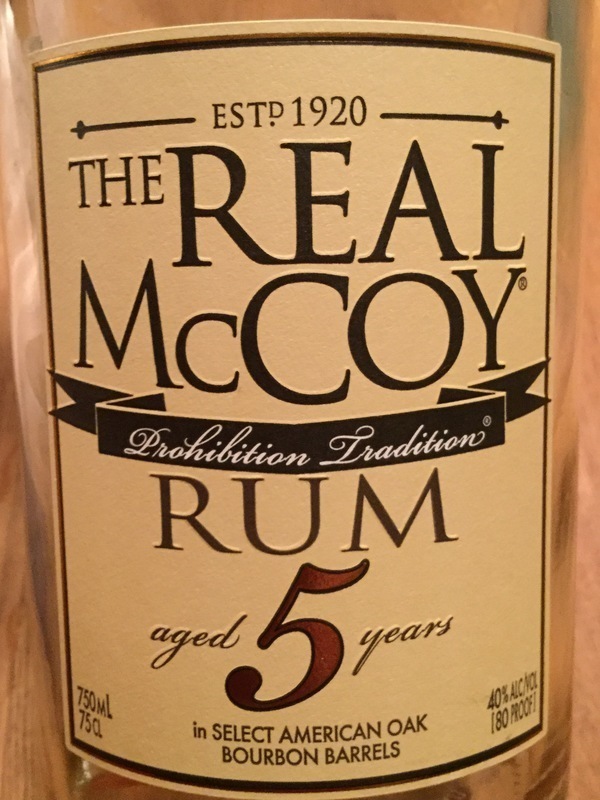 The Real McCoy 5y rum bottle and label design is very lame and boring. Light golden color. Industrial strength drain cleaner to the nose and palate. Awful burn at the end. Mix it with Coke and down it goes. I wasn't impressed with this. I has it as part of a tasting with many other rums and found this about the worst of the batch. I don't mind dry rums, but this was quite bitter and the oakiness couldn't save it from that. Doorly's is much better. Ce rhum ne dégage pas beaucoup de goût et de complexité. Il est très doux et pour moi fini avec en rhum and coke. Il n est pas mauvais mais pas wow. This is one of three dry rums that I picked up on my recent trip to the Emerald Coast of Florida. It was also the least appealing of all three, but still made it to my initial rating of 7. This rum was the only available vintage where I bought it, but I was hoping to find the 12 year old. Since this was my very first rum from R.L. Seale, I just had to try it. This proves that rums do not need additives to be enjoyable. For bourbon drinkers who claim to be allergic to gluten, this rum is your answer! (By the way, a nurse friend of mine told me that the current fear of gluten is all a hoax and maybe only 1% are truly allergic and that businesses are taking advantages of fears from fruitcakes who are not even allergic). At any rate, this rum tastes like a mixture of a tiny bit of natural sweetness with charred oak bourbon barrels. Unfortunately, I bought it along with a bottle of Ron Medellin 8 Year, another good dry rum from Columbia. No contest since the Ron Medellin wins hands down for smoothness. Since both the Real McCoy and the Ron Medellin are very hard for me to get again while Dictador 12 is easily available for only $8 more with many more flavors than this Real McCoy 5, I will stick with Dicatador 12 from Columbia as my go to rum for being both dry and naturally sweet. Medium Amber colour. Strong alcohol nose ,even after resting for ten minutes, good balanced flavour with very good finish. With ice added, it brings out the cask smell and mellows the alcohol. I easily sipped this and enjoyed it. I could only imagine how good a mixer this could be. I wish the 12 year was available, more cask time would make this great. This is light on the nose and goes down easy. I poured it neat, and it had a light but intoxicating aroma with hints of the molasses and barrel aging and a very subtle sweetness like banana. You have to be careful to not inhale too deeply to try to find more, as you'll just get more of the vapor and burn your nose. Step away, and come back to enjoy the light bouquet. The first sip is smooth, and leaves you wanting more. It has a subtle oakiness that fills your mouth with flavor, but doesn't hit you over the head with it. It leaves behind a subtle sweetness that could make for a good crossover rum for enthusiasts who enjoy sweeter rums (like Diplomatico), but want to be able to enjoy something without the additives. It's not nearly as sweet as a Diplomatico or a Zaya, but that hint is nice. Big, Bodacious, Bajan. I’m a doctor, not a rum runner. Super lækker rom til pengene. Kunne jeg godt finde på at købe. À ne pas louper, pour un 5 ans il est très sec et très complexe. Un vrai bouchon à vis à l'inverse des gammes doorlys et Foursquare. I'm biased as I truly enjoy drinking Foursquare rums. This is a very good rum. Tastes like a lighter version of the TRM 12 year. it's a while ago, so do not remember very good. I liked it, not very special.